As America’s dream of nation-building in Afghanistan gets sand stuck in its gears, Russia, fighting its own war against a new generation of heroin addicts, wants poppy production slashed. As Russia grapples with its ominous demographic situation – according to the grimmest estimates, the population could tumble by as much as 3 million people to below 140 million by the next decade – it should come as no surprise that heroin addiction, which kills up to 30,000 Russians annually, sits front and center on the Kremlin’s radar. Finally, Ivanov provided perhaps the most convincing argument of all that the Afghanistan’s drug production needs to be given the highest priority: Afghan heroin helps to nurture the very roots of terrorist networks. Ivanov then drew a direct parallel with Russia’s past experience in dealing with the world’s premier terror mastermind, Osama bin Laden, who the Russians say funneled enormous funds to Chechen rebels. But what makes the Afghan drug problem for Russia different from the specter of, say, alcoholism, road fatalities or serious illnesses is that a solution to the problem is not dependent upon Russia’s efforts alone. Indeed, the success of Russia’s campaign against heroin addiction hinges on the efforts of the coalition forces in Afghanistan, of which the U.S. dominates in terms of both numbers and leadership. Timothy Jones, the Drug Enforcement Administration’s attaché at the U.S. embassy in Moscow, echoed Ivanov’s positive assessments of the joint efforts now occurring between Moscow and Washington on the drug front. Jones then reiterated Ivanov’s remarks that the heroin problem is not relegated to Russia alone. The DEA’s Moscow attaché then stressed the need for all nations to work together to defeat the heroin problem. Jones then spoke at length about the DEA’s work in Afghanistan. But the US embassy’s DEA attaché stressed that the United States was not working alone to defeat the drug traffickers operating in Afghanistan, and discussed the DEA’s cooperation with Russia’s FSKN, as well as other affiliates in the field. One area where the United States and Russia have opposing views on how to beat the drug traffickers at their own game involves the use of airplanes, which Russia said could fumigate the poppy fields. So far the United States has responded coolly to the proposal, and this continues to vex the Russians. Ivanov then quoted the political analyst and author, David Kilcullen, the author of the book, "The Accidental Guerrilla," a copy of which he hoisted into the air at his Moscow media conference. DEA Attaché Timothy Jones said that the coalition forces, not just the U.S. forces, were against the use of employing herbicides against the drug traffickers over fears it might spark some sort of a backlash from the local population. Jones, arguing that an “educational process would need to take place before we just started spraying chemicals,” said the chemicals from aerial spraying could get into the soil and water supply, possibly harming children and animals. Although this is one point of contention between the United States and Russia, it seems that in the future a compromise may be found and active defoliation of the poppy fields may begin in earnest. On the face of it, there really seems to be no other way to tackle the problem. After all, 7,700 tons of opium was produced in Afghanistan last year, officials say, which accounts for 93 percent of total global opium production. 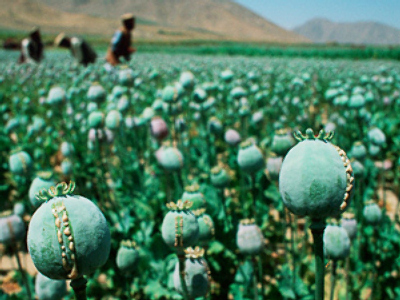 Needless to say, opium is Afghanistan's cash crop. 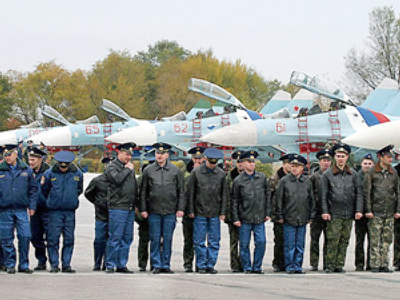 Will the United States eventually give in to Russian demands for an active defoliation program, perhaps with the direct assistance of Russian planes and pilots (after all, the job would certainly contain extreme risks, especially when we consider that around 3 million Afghan people are dependent directly or indirectly on opium production)? Stranger things have happened. Who would have guessed, for example, that Russia would agree to give American military planes clearance to fly over Russian airspace to a distant theater of war? But that is exactly what is happening today, and it seems that Russia will expect some sort of concessions for these flights. Ivanov hinted as much in Washington. Given this grim political landscape that presents a massive threat to both former Cold War powers, some form of mutually advantageous cooperation should be achievable. 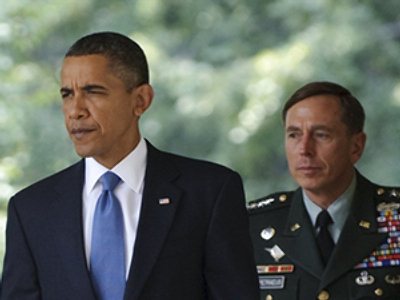 After all, both countries share more or less the same nightmares over Afghanistan.